Brighten up your home with a decorative plant stake using a wood dowel. To create the panel for the top of the stake, lay (7) Red Colored Wood Sticks horizontally. Glue (2)Mini Wood Sticks vertically across the 7 sticks to secure the shape. Use Acrylic Paint to decorate your panel. We painted a heart and arrow with the word “Love” in the middle. Outline your design with Red Glitter Glue and let dry. Paint the Wood Dowel and allow to dry. Glue the wood dowel to the back of the panel. 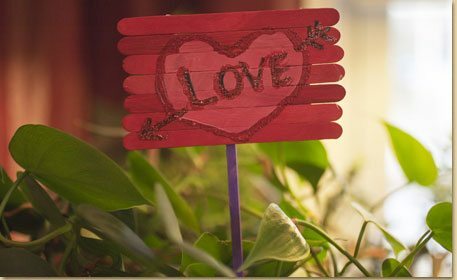 Once dry, place your plant stake in a flower arrangement for Valentine’s Day or everyday!